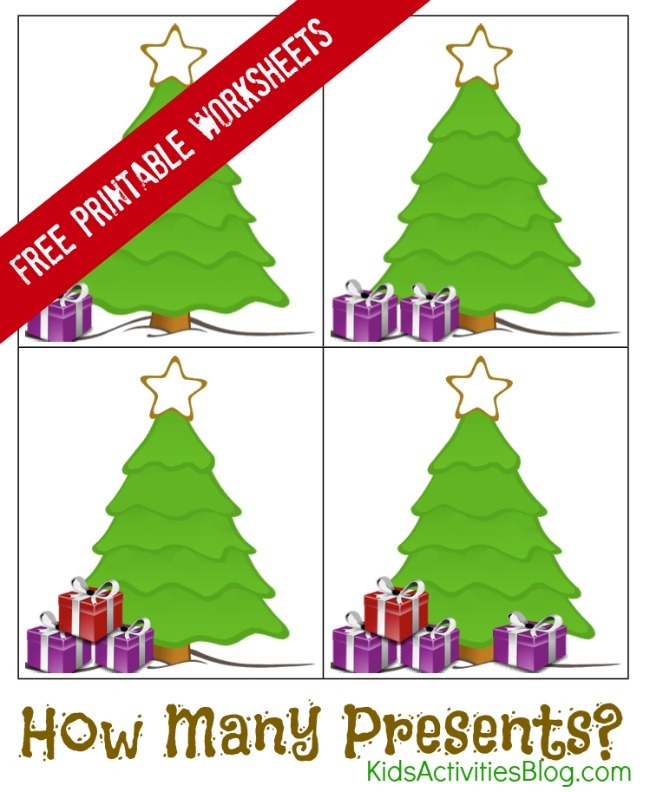 These Christmas math worksheets are perfect for the preschool set learning to count. It has been a ton of fun finding December activities for kids that tie in lessons in a festive way. Today Kids Activities Blog is excited to feature worksheets made by our friends at Pre-K Shop. This is a simple and fun activity for kids to count the number of packages under the tree and then add the correct number star to the top. During the holidays this is an easy math game to play. Counting just about anything is a lot of fun. There are even songs devoted to it…The 12 Days of Christmas! Ornaments on a tree – choose a color or shape to count. Cookies on a plate – have your child set up rows of 10 or choose 2 to eat. Houses on your street with holiday lights – likely single lights will be too numerous to count, but finding white-lit trees or Santa displays can be a math treasure hunt. Stockings hung on the mantle. Cups of flour that go into the cookie batter. Having festive fun this season can go beyond Christmas Math Worksheets and learning to count exercises. Here at Kids Activities Blog, we have had all sorts of fun! 3 Christmas Coloring Pages – they are oh so cute! These Christmas activity sheets have been created by our friends at Pre-K Shop, who specialize in nap mats and backpacks for toddlers and preschoolers. You can view all their cute designs – including nap mats that can be personalized – at PreKShop.com. Connect with them on Pinterest or Facebook. This is a brilliant idea! My son always gets bored of counting activities, but I think counting presents could keep him engaged for awhile. Thanks for the printable! Love the idea. I need to add a holiday section to my site. I’m working on it. The images are just wonderful.